Oregano- The undisputed winner here, oregano renders a certain aromatic flavor to food that makes it a perfect addition to Italian, Mediterranean and Mexican dishes like pizzas, salads, garlic breads, and eggs. It contains many phytonutrients and its medicinal properties were found to be effective in inhibiting bacterial growth. Oregano, in the fresh or dried form, should be used at the end of the cooking process to retain flavor. Rosemary- It is a native to the Mediterranean cuisine and it contains substances that stimulate the immune system and improve digestion. Add a whole sprig to season soups, stews, and meat dishes and simply remove it before serving. Thyme- It is a common herb that originates from areas such as Asia, southern Europe, and the Mediterranean region. Thymol, a volatile oil in thyme gives it its characteristic aroma. 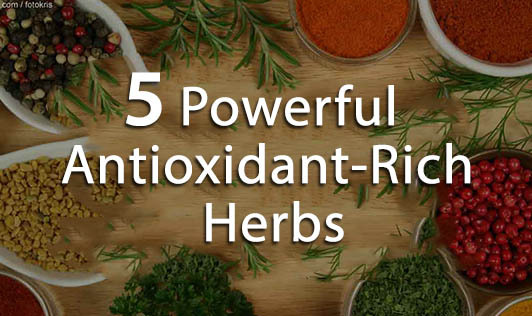 It contains antioxidant flavonoids called thymonin. Thyme has been used in treating respiratory problems, cough, bronchitis, and chest congestion. Peppermint- It contains a phytonutrient called Perillyl alcohol, found in peppermint oil. It contains a good amount of vitamin A and C, and Omega 3 fatty acids as antioxidants. It helps to soothe the stomach and relieves digestive discomforts. Sage- Sage is native to countries surrounding the Mediterranean Sea. Like rosemary, sage contains a variety of volatile oils, flavonoids and phenolic acids. It is used for treating conditions like rheumatoid arthritis, bronchial asthma, and atherosclerosis. Since the flavor of sage is very delicate, it is used right before serving. It is used as a seasoning for tomato sauce and to garnish pizzas, omelets, and meat dishes.